doing. He will do even greater things than these." 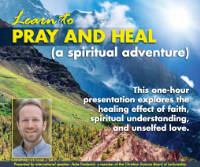 Please join us and learn how to pray and heal during one-hour presentations on April 27th and 28th. Learn more here about this opportunity to explore the healing effect of faith, spiritual understanding and unselfed love.